Last week, an article about my research, written by Joseph Brean, appeared in the Canadian newspaper The National Post. Considering the reputation of the Postmedia Network, I was skeptical as soon as he contacted me, so before agreeing to do the interview, one of the first questions I asked was whether we could include someone from the community in the interview. He said that he had already written most of his article and that getting a local opinion “wouldn’t make much difference.” While this attitude was clearly a warning sign, I realized that he was going to publish the article no matter what, and so I decided to speak with him about it, because I wanted to try and ensure that he accurately understood what my co-author and I said in the paper. Unfortunately, the piece that was eventually published had a headline that was offensive to Inuit and content that did not fully explain our argument, instead reducing complex ideas to a statement designed to provoke controversy. In this post, I want to clarify the conclusions of my research, and why they matter. First, I would like to highlight that my research is based on long-term engagement with the local community. I first went to Kangiqsujuaq in 2011, as part of an archaeology project run by the Avataq Cultural Institute. I returned to Kangiqsujuaq in the summer of 2012, spending two months studying Inuktitut with Piirtiu (Père Dion), making friends and learning about the community, and again, working on archaeological projects with Avataq. After these first two seasons, I returned to Kangiqsujuaq in the summer of 2013, and remained in the community for a full year to complete my research project. I felt that living in the community for an extended period of time was important, so that I would better understand the local culture and way of life before analyzing the data I collected. During the year I lived in Kangiqsujuaq, I not only conducted hundreds of interviews, but I lived with an Inuit family, spent many of my afternoons and evenings visiting in Inuit homes, attended community events, regularly volunteered at the school and occasionally even substitute taught. Whenever possible, I followed along on hunting and fishing trips with my friends in the community, learning as much as I could about traditional subsistence. I was particularly lucky that Yaaka Yaaka, a local hunter, conservationist, and educator, felt that my research was important—and also thought that I was a semi-decent snowmobile driver—and consequently invited me on numerous hunting and fishing trips. My experiences with Yaaka—including the many stories that he shared with me while out on the land, and watching him teach traditional skills to young Inuit—have strongly shaped my perspective on contemporary Inuit livelihoods and culture. Based on the data I collected during the year that I spent in Kangiqsujuaq, I have written several articles on Inuit food security and food sharing. My work on food security has critiqued the application of standard survey tools to Inuit, showing that the importance of country food means that standard tools, originally designed for Euro-American communities, do not capture some important dimensions of Inuit food security. I have consequently emphasized the importance of access to harvesting equipment and education in traditional skills for supporting Inuit food security. My research on sharing, which was picked up in Mr. Brean’s article, actually demonstrates that country food sharing has numerous economic benefits for Inuit today, especially through relationships of mutual support and assistance, such as when hunters exchange with each other, so that they all have access to fresh food even if they didn’t all make a catch on a given day, or when older people share equipment with young hunters, receiving a share of food as thanks when the hunter returns. These economic benefits are in addition to the many positive social aspects of sharing which I experienced firsthand during my fieldwork, and of course, the nutritional benefits of country food. Country food sharing ties between households in Kangiqsujuaq. Reciprocal (two-way) sharing ties between households in black; one-way sharing ties in grey. One of the benefits of giving that we find is that people from households who share generously are more likely to have positions of influence within the community. This is not always true—there are other ways to gain the respect of others, but sharing is an important part of demonstrating that a person cares for their community. So, the link between sharing and political influence is not because individuals are deliberately trying to gain favour when they give food away, but simply because being generous is considered to be an important part of being an Inuit leader. When someone is generous, others remember it when they cast their votes. If you read historical accounts of Inuit political systems, it is clear that this reflects traditional forms of leadership among Inuit: the voices of generous hunters often carried weight, even if they were not formal leaders. While the persistence of such cultural values is obvious to anyone who has spent much time in the Arctic, it is not obvious to many people from the south who erroneously believe that Inuit and other indigenous peoples in Canada have lost their traditional cultures. This is one reason why I emphasize this point—it is critical for people outside of the Arctic to recognize that modern Inuit institutions continue to be shaped by traditional cultural values. In fact, in an era of political leaders such as Trump and Doug Ford, I think the fact that Inuit often choose generous people to be leaders to be highly admirable. For all these reasons, then, we argue that “harvesting persists in Inuit settlements because Inuit economic life is inseparable from complex obligations that integrate kinship, politics, economics, and sociality.” However, unfortunately, there is also inequality in Inuit communities. This is largely due to high levels of poverty: there are some Inuit who have a standard of living comparable to other middle-class Canadians, but there are also many who are very poor. This is shown in my work on food security: 41% of households are food insecure, and among those households, the degree of food insecurity they are experiencing appears to have increased over the past decade. In our work on sharing, we find that patterns of sharing are affected by these high levels of poverty. Because of the colonial history of settlement and development in the Arctic, hunting today requires snowmobiles, guns, and many other supplies that cost money. For the same historical reasons, Inuit have inadequate access to the jobs that now are required to purchase the supplies needed for hunting. This means that some people are not able to fully participate in sharing, which means being able to give as well as receiving from others. For example, many young men, even if they are unemployed, help themselves and their families by hunting, sharing food with people who lend them equipment, and sometimes selling a portion of their catch to the Hunter Support Program. However, young men who do not know how to hunt, or who don’t have family members who are able to share equipment with them or help them pay for gas, are unable to support themselves or others in this way. Consequently, not everyone is able to be generous with country food, even if they want to. 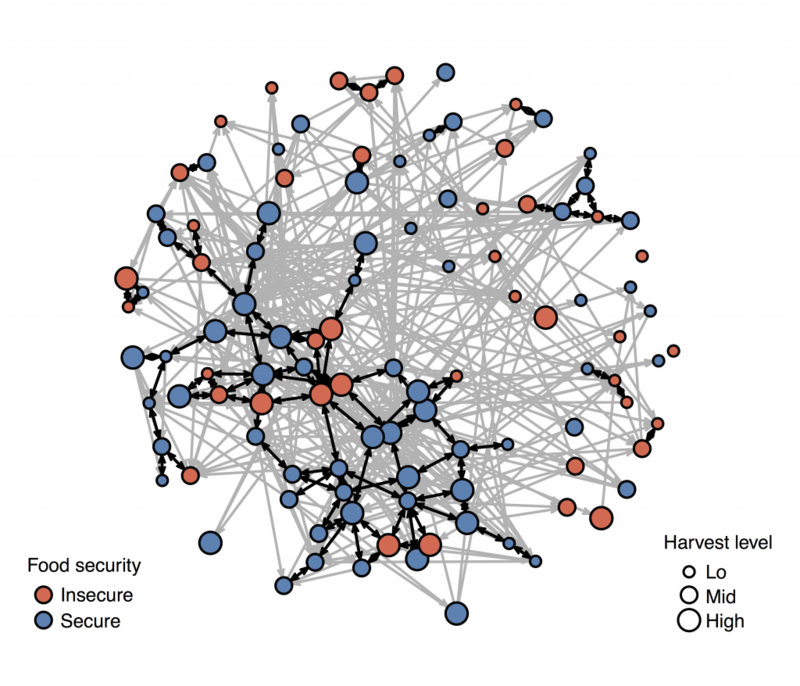 Our point about the relationship between food sharing and inequality is that some people are more able to access the resources they need to hunt and share; and giving food then produces relationships that shape future interactions. Those relationships are very important for people’s social and economic well-being; through time, the correlation between having access to money, and participation in hunting and sharing might consequently increase inequality between those who have access to jobs, and those who do not. This includes the relationship between sharing and influence: it can be more difficult for someone to be recognized as a generous person who cares for the community if they have little to share. 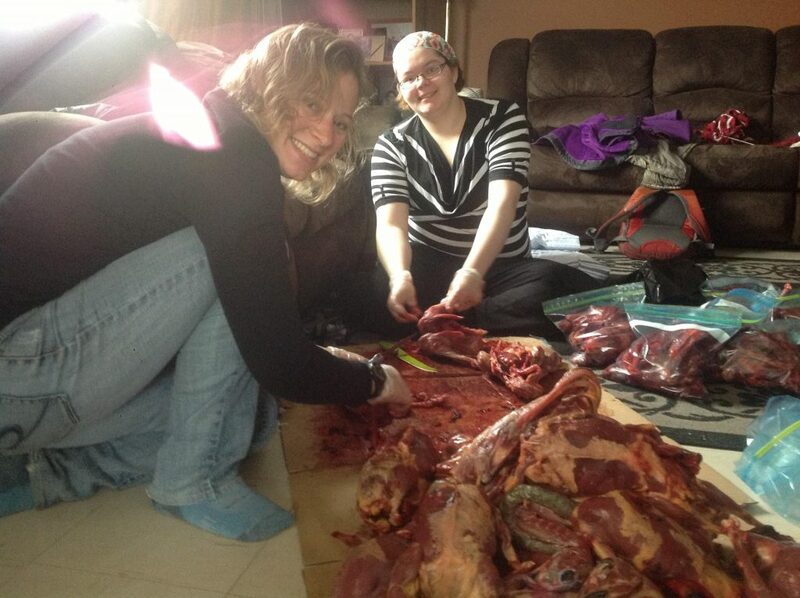 Helping to cut up a fall catch of kanguvinig (snow geese). Photo by Eva Annahatak.